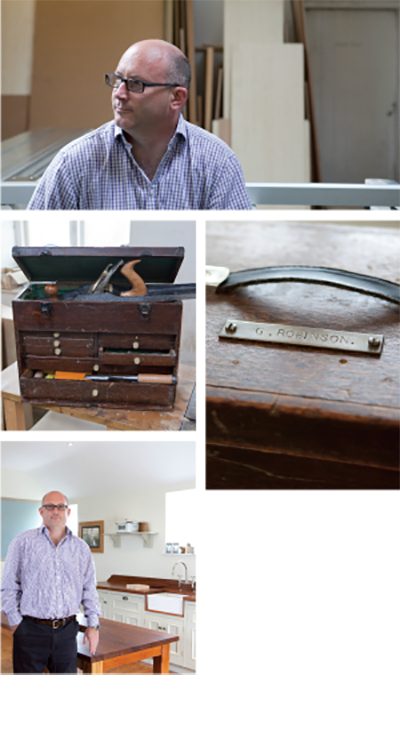 “My great grandfather was also called George Robinson, and I have his name tag on the tool box I use today. He was a master carpenter and made many of his own tools; they are as good now as they were a hundred years ago. Perhaps this has given me my concern for the environment, which is an integral part of my working philosophy. We use wood from sustainable forests as much as we can, and the appliances we fit are chosen in part for being energy efficient. I am anxious that we hand on not only our tools but also the kitchen furniture we make as an inheritance to future generations. One of my passions is for my allotment and the vegetables I grow there. I love to see them develop from seedlings to the fully grown produce I enjoy cooking. In the same way, when I look at a kitchen space and start to plan its design, I have a sense of excitement that will develop until my colleagues and I can stand back from a finished kitchen and feel all the satisfaction of a job well done.